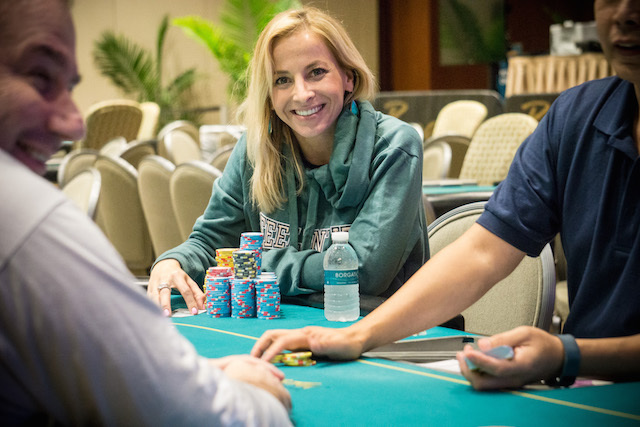 Anna ‘OhUrAPro’ Antimony used to grind on the slim margins of the Borgata $2/$5 cash games until a tournament result opened her game and life up to new possibilities. Last November, Antimony chopped the Borgata Fall Poker Open Event #1 for $126,146. For the first time in her professional career, Antimony had the bankroll flexibility to take a deep breath and bask in the glow of the work put in to reach this point. This wasn’t Antimony’s first stab at a tournament during her professional life. Antimony was a staple in lower buy-in Borgata events like the Saturday Series but never got over the hump required to play larger buy-ins or a consistent basis. Finally, she did and hasn’t looked back since. Antimony carried over her success in 2017, where she collected $167,285 in live earnings along with her first two Borgata Poker Open trophies. One of those wins came in the prestigious Six Max event where she beat a tough final table with Mark Dube and TJ Shulman finishing on the podium. The win also represented a culmination of Antimony’s efforts into improving her own game. Antimony owns a strong group of friends in the poker community, including WPT500 winner Jon Borenstein. In addition to talking over hands, Antimony watches tournament live streams to learn from other players and how they play certain spots. Now that she has a title and more experience playing in four-figure buy-in events, the general expectation might be for Antimony to shoot higher and try to become a regular on the East Coast circuit. Not so fast. Coming into 2018, Antimony’s goals in life do not center around poker. The balance that many players seek is something Antimony wants to achieve for herself. Antimony clearly has a passion for the game but the emotional toll of having poker be the sole source of income is starting to gradually weigh on her. So, if playing less poker means more personal stability in the new year, Antimony is going to make the appropriate sacrifice. “I’d like to venture out into new things. As much as I love the game, I can’t see myself doing this my whole life for a living. I’ve also found I play better and am way happier when I take breaks and do non-poker stuff with friends and family,” Antimony said. The one time during next year when Antimony plans to put her full heart and soul into grinding is the World Series of Poker. Antimony limits her travel for most of the year but is already eyeing a big summer out in Las Vegas. It could very well be her but before that time comes, Antimony is expected to play a heavy schedule in January’s Winter Poker Open and perhaps come close to nearing the exit point she’s searching for.